Aristotle Onassis was a born orator, and Jackie Kennedy would sit and listen to him spin off tales and stories-often racy-by the hour. A speaker of seven languages, he could keep a dinner party of some of the world's most sophisticated conversationalists spellbound. Even Jackie couldn't help but drop her reserve and laugh with him. 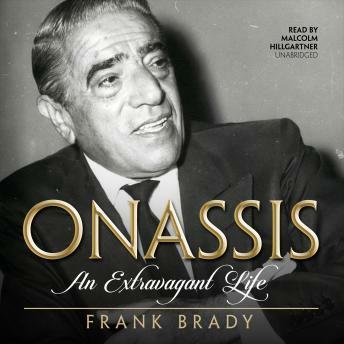 America's First Lady simply never knew anyone quite as free or exotic as Aristotle Onassis, a paradoxical blend of raconteur and ruffian.Beginning with Aristotle Onassis' childhood and his first financial success as an Argentine tobacco dealer, author Frank Brady gives the listener an intimate account of Onassis' rise to the ranks of super-billionaire. Brady captures all the drama and romance of this glamorous tycoon, peeling away the persona to reveal the husband, lover, father, financial wiz, and companion to the Churchills, Kennedys, and Roosevelts.